« Day 252 – Heather M.
Day 253 – Harvey T.
On any given night some 671,000 people in the United States, of which 5,320 are located in DC, are homeless according to the National Alliance to End Homelessness. Harvey is one of them. I saw him sitting on the ground next to the entrance to McDonald’s on M Street between 19th and 20th Streets in Northwest. 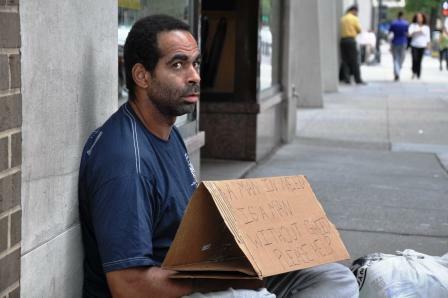 On his lap was a sign that read, “A man in need is a man without greed. Please help.” Next to him was a styrofoam container of food and a bag of personal items. He says that he feels lucky in the sense that people often help him. “I usually get about $30 a day out here.” Harvey says that gets support from people from a wide range of socioeconomic backgrounds and races with one exception: Asians. “I don’t know why but Orientals never help me out.” He goes on to tell me that people who appear to be lower glass give more often than those who appear to be middle and upper class. He goes on to say that some of his challenges are a result of his mental illness. “Most homeless suffer from sort of mental problem or physical problem. I’m bipolar.” Harvey says that he has often thought about committing suicide. He doesn’t take any medication to help with his mental illness either. He told me that he was going to use the ten dollars to get him some food over the next couple days and also buy a couple of beers for the evening. “I don’t do any drugs or hard liquor. The hard stuff makes me suicidal,” Harvey confessed. I shook his hand and wished him luck. He mentioned some items that he needs and I have added them to the Lend a Hand page. If you would like to help the homeless in Washington, DC, I encourage you to support your local Street Sense vendor or make a donation through their website. Admire this story so much. It amazes me how upper class and middle class wont help homeless individuals. I guess they have the mentality that they can go out and find a job so they wont have to beg but often times it can be very hard. I discovered your blog last week and have been enjoying reading your daily stories. Keep up your good work, I’ll keep reading. Another interesting person living without. We have noticed an increase in the amount of women also on the streets in our area.